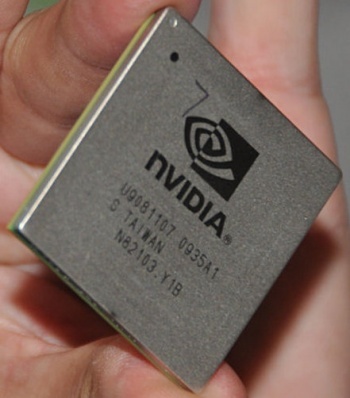 NVidia has announced some of the features for its newest line of graphics chips based on Fermi chip architecture. NVidia's next line of GPUs is codenamed GF100 and is the first graphics chip that will utilize the Fermi chip architecture. nVidia has been releasing snippets of information on the new cards on Facebook and Twitter for the last few weeks, the last of which came out yesterday. The GF100 will support a new type of 32x anti-aliasing, which basically means the edges of objects in graphics will now look more awesome. Also, 3 billion transistors! By all accounts, that is a veritable crapload of transistors. GF100 is the codename for the first GeForce GPU based on the Fermi architecture! The GF100 board is 10.5-inches long -- the same length as GeForce GTX 200 Series graphics cards! GF100 graphics cards will provide hardware support for GPU overvoltaging for extreme overclocking! GF100 supports a brand new 32x anti-aliasing mode for ultra high-quality gaming! Note to nVidia: I want a GF100 for Christmas. Let's make it happen.